Dermal Complex 1 is a high-molecular, non-stabilized hyaluronic to-that 1%, non-animal, obtained biosynthetically. Concentration 10 mg / ml 1.5 million Da. Sodium hyaluronate, sodium chloride, phosphate buffer, water. 1 1.5 ml syringe based on hyaluronic acid (10mg / ml) / sterile product. Designed for biorevitalization, with age-related skin changes (fine wrinkles), atrophic and hypotrophic scars, rosacea, acne, stretch marks. “Dermal Complex 1” should be injected into the healthy skin treated with a disinfectant solution without signs of inflammation. The method of administration is extremely important for the successful use of the drug, so the drug should be used only by physicians specially trained in the method of injecting the drug. Before injection, the injection site should be thoroughly disinfected. Slowly administer the drug using the appropriate method. The amount of drug administered depends on the nature of the wrinkles. “Dermal Complex 1” should be stored at 2–25 ° C in a dry place in its original packaging. Protect from light and heat, do not freeze, handle with care. Dermal Complex 2- is a high-molecular non-stabilized hyaluronic to-that 2%, not of animal origin, isolated on the basis of biosynthesis. Concentration 15 mg / ml 1.5 million Yes. Sodium hyaluronate, sodium chloride, phosphate buffer, water. 1 1.5 ml syringe based on hyaluronic acid (20mg / ml) / sterile product. Dermal Complex 2 is a high viscosity gel based on hyaluronic acid for intradermal administration. Designed for biorevitalization, with age-related skin changes (fine wrinkles), atrophic and hypotrophic scars, rosacea, acne, stretch marks. “Dermal Complex 2” should be injected into the healthy skin treated with a disinfectant solution without signs of inflammation. The method of administration is extremely important for the successful use of the drug, so the drug should be used only by physicians specially trained in the method of injecting the drug. Before injection, the injection site should be thoroughly disinfected. Slowly administer the drug using the appropriate method. The amount of drug administered depends on the nature of the wrinkles. “Dermal Complex 2” should be stored at 2–25 ° C in a dry place in its original packaging. Protect from light and heat, do not freeze, handle with care. 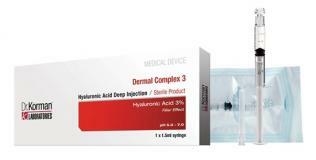 Dermal Complex 3 is a high-molecular non-stabilized hyaluronic to-that 3% non-animal origin, isolated on the basis of biosynthesis. Concentration 20 mg / ml 1.5 million Da. Sodium hyaluronate, sodium chloride, phosphate buffer, water. 1 1.5 ml syringe based on hyaluronic acid (30mg / ml) / sterile product. Dermal Complex 3 is a high viscosity, hyaluronic acid based gel for intradermal administration. Designed for biorevitalization, with age-related skin changes (fine wrinkles), atrophic and hypotrophic scars, rosacea, acne, stretch marks. “Dermal Complex 3” should be injected into healthy skin treated with a disinfectant solution without signs of inflammation. The method of administration is extremely important for the successful use of the drug, so the drug should be used only by physicians specially trained in the method of injecting the drug. Before injection, the injection site should be thoroughly disinfected. Slowly administer the drug using the appropriate method. The amount of drug administered depends on the nature of the wrinkles. “Dermal Complex 3” should be stored at 2–25 ° C in a dry place in its original packaging. Protect from light and heat, do not freeze, handle with care.